(Lowell, MA) You know a play hooks you when you start to get uncomfortable from the opening moment. As the lights go up in Slow Food,, we see two diners, Peter and Irene (Joel Van Liew and Daina Michelle Griffith) looking wane in a Greek restaurant as they begrudgingly sip glasses of water and wait. 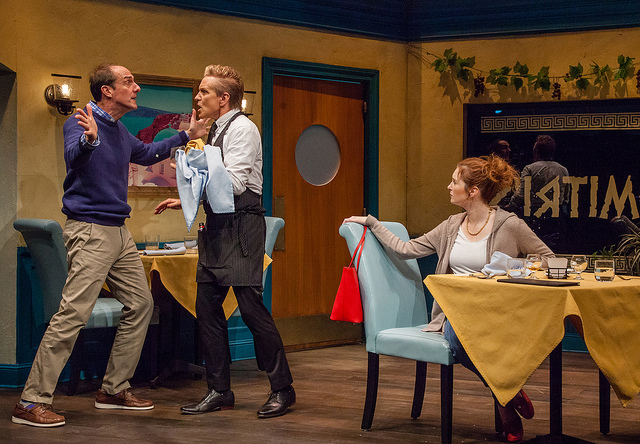 By the time the waiter, Stephen (Brian Beacock), appears, it is hard not to hate him. Everyone has been here – hungry, yet needing to be civil and at least pretending to have a good time. We are let into the personal and uniquely first-world hell of slow service at a restaurant. Within a few minutes, my mind wandered anxiously into whether we were trapped to watch a play that would resemble an overlong SNL skit. After all, too many high school one-act festivals have some variation of the “service is terrible” theme and there’s a reason why “waiter, there’s a fly in my soup” is one of the first joke setups we learn as children. I needn’t have worried. This universal experience of dissatisfaction was merely the opening gambit in a well-written comedic meditation on marriage. Peter and Irene, a busy couple just beginning to experience an empty nest, are on the first day of an anniversary trip, and this terrible dinner forces them to slow down and fall in love again. As a lucky audience, we are there to witness this fasting yet sweet couples’ therapy. In this space, Griffith is a revelation as Irene, a character who has the emotional intelligence as a therapist to manage the unfolding culinary disaster, but whose low-blood sugar forces her to admit her needs in endearing and comical ways. With pregnant looks, Griffith makes her character an open book, which matches so well with Van Liew, who brings wavering stoicism to his Peter’s hunger. The two also commit fully to the physical comedy at hand, which is hard not to love. Beacock is given the tougher job of being the fly in the ointment of a waiter for the play, and the script never gives him the chance to fully flesh out Stephen to be more than a character to be discussed in a post-vacation slideshow. In a lesser production, this could have proven a disaster, since Stephen’s character attributes borders being the stereotypical model of a gay man from California. Luckily, director Sean Daniels and the cast strike just the right tone to avoid this, especially in a scene when Peter attempts to flirt with Stephen – while he’s clearly not used to flirting with men, it’s key that he lacks any homophobic squeamishness in his attempts, and that makes all the difference. This is the world premiere of Slow Food, and there are a few moments where it still has room to grow, but while this production sometimes must feel its way, it never loses it. It proves to be a satisfying and sustaining meal in the end. This entry was posted in Uncategorized and tagged 2019, Brian Beacock, California, Craig Idlebrook, Daina Michelle Griffith, February, January, Joel Van Liew, Lowell, Manhattan’s Lower East Side, Meghan Moore, Merrimack Repertory Theatre, Sean Daniels, Slow Food, SNL, Wendy MacLeod by craigidlebrook. Bookmark the permalink.